The 2016 STAR Award Winners! 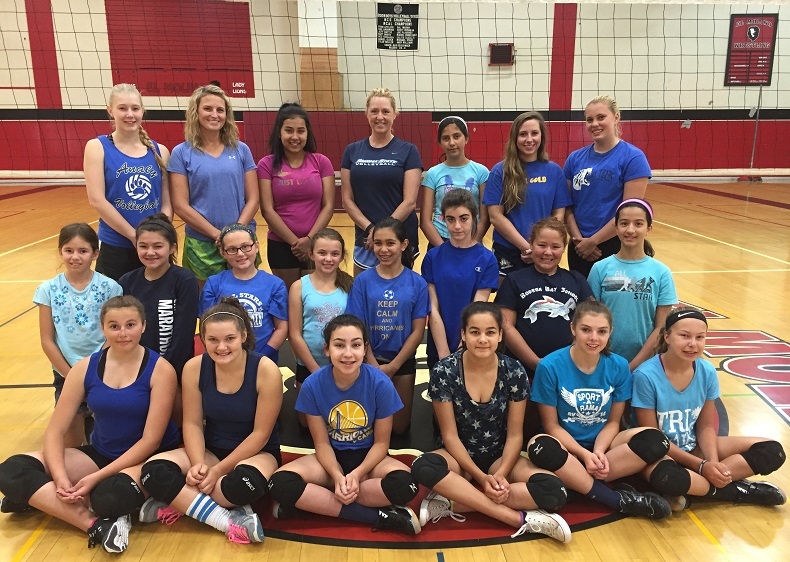 Back Row: Coach Talullah Kuula, Coach Jessica Flanagan Keene, Maritza Gallardo, Coach Sharon Lochert, Theresa Weigel, Coach Katey Holley, Coach Sabrina Stephens. Middle Row: Isabella Limper, Maile Warner, Frances Marshall, Kiley Capell, Kayla Zinkovich, Genevieve Fontaine, Elsie Castro, Marquesa Weigel. Front Row: Isabella Raia, Rebecca Asbury, Rachel Mortimer, Della Swan, Sophia Ramazzotti, Rachel Gehring. A camp flyer can be downloaded here! Coach Lochert has several reasons for continuing to invite us to come from Virginia. *	Availability of staff to before the after camp to both players and parents! * The value: both in price and in coach:camper ratio! Do the other camps that your daughter has attended offer you all this? Coach Houser is the owner of STAR Volleyball Services LLC. He is the author of the "I Can't Wait" to coach books, and Drill Collection. He is presently coaching a 15's National club team in Roanoke, Virginia. You can see more about Coach Houser here. Coach Flanagan became the head volleyball coach at Ferrum in May of 2012 after serving as the JV coach at Floyd County High School and she was assistant coach for the varsity program. Flanagan was also head coach for one season of the Floyd 18s. Coach Flanagan attended school at Ferrum and was a four-year player on the volleyball team. She also played softball two years. She earned four straight All-Conference volleyball honors from the USA South Athletic Conference from 2006-09. Coach Flanagan received the 2010 Ferrum College President's Cup, which is presented annually to the graduating student-athlete who best exhibits excellence in academics, campus and community leadership, and character. She is now an elementary PE teacher in Roanoke, Va.
You can contact her at jlflanagan@ferrum.edu. Katey became the assistant coach at Lenoir Rhyne College in May 2016!! She is making her 4th trip to Sonoma County with Coach Houser! Katey just finished a stellar 4-year volleyball career at Averett University in Danville, Va, where much of the time she has been the starting libero. She is a 2012 graduate of Westover Christian. She played school ball for 6 years, club ball for 3 years. During her senior year at WCA, the team won their first ever VACA state championship and she was named tournament MVP. That same year, she was named Metro Danville Player Of The Year. She has assisted with eighteen STAR camps, has directed divisions at six, and has also coached 4 years of youth volleyball in Danville. You can contact Katey at kmholley@aumail.averett.edu. The Hillcrest Middle School STAR Camp in 2013! The Analy High School STAR Camp in 2014! The El Molino School Camps in 2015! The STAR camp is here, and its awards are here. The High Expectations camp is here and its awards can be seen here!